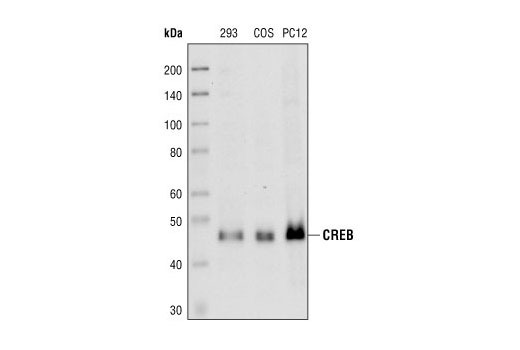 Western blot analysis of extracts from 293, COS and PC12 cells, using CREB (86B10) Mouse mAb. Confocal microscopic images of SK-N-MC cells showing nuclear stain with CREB (86B10) Mouse mAb (red). Blue pseudocolor = DRAQ5 (fluorescent DNA dye). Flow cytometric analysis of NIH/3T3 cells, using CREB (86B10) Mouse mAb antibody (blue) compared to a nonspecifc negative control antibody (red). 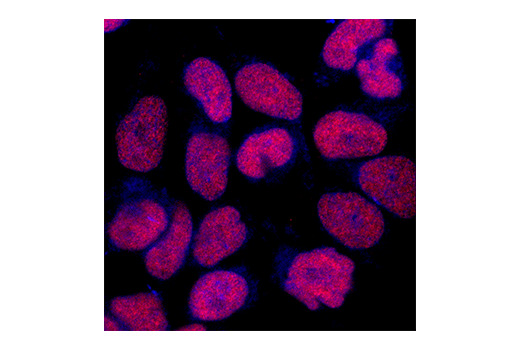 CREB (86B10) Mouse mAb detects endogenous levels of total CREB-1 protein. The antibody may also detect the CREB-related protein, ATF-1. Monoclonal antibody is produced by immunizing animals with recombinant protein specific to human CREB-1 protein.